The solid state hard disk on module is a storage device based on flash memory technology, which emulates an ordinary magnetic hard disk. 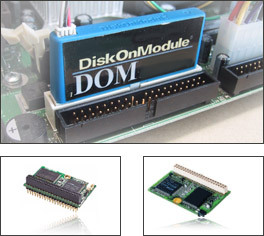 The DiskOnModule series products provide an all in one module solution for solid-state flash disk. The DiskOnModule is suitable for use in portable and embedded systems which have limited space and power consumption. Visit our new Solid State Section! SATADOM-ML 3ME3 with Pin7 VCC Supported w/ Toshiba 15nm(Industrial, Industrial, W/T Grade, -40 ~ 85? SATADOM-ML 3ME4 with Pin7 VCC Supported w/ Toshiba 15nm(Industrial, Industrial, W/T Grade, -40 ~ 85? SATADOM-SH TYPE C 3ME3 with Pin7 VCC Supported w/ Toshiba 15nm(Industrial, Standard Grade, 0? ~ +70? SATADOM-SH TYPE C 3ME4 with Pin7 VCC Supported w/ Toshiba 15nm(Industrial, Standard Grade, 0? ~ +70? SATADOM-SH TYPE D 3ME3 with Pin7 VCC Supported w/ Toshiba 15nm(Industrial, Standard Grade, 0? ~ +70? SATADOM-SH TYPE D 3ME4 with Pin7 VCC Supported w/ Toshiba 15nm(Industrial, Standard Grade, 0? ~ +70?